Explanation: Tonight the Perseid Meteor Shower reaches its maximum. Grains of rocky ice will streak across the sky as they evaporate during entry into Earth's atmosphere. These ice chips were shed from Comet Swift-Tuttle. The Perseids result from the annual crossing of the Earth through Comet Swift-Tuttle's orbit. The Perseids are typically the most active meteor shower of the year. In a clear dark sky, an observer might see a meteor a minute. 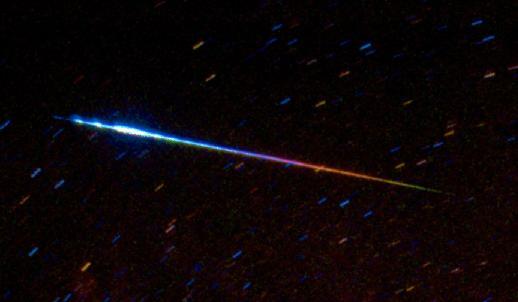 Pictured above is a Perseid meteor from 1993. The colors are representative but digitally enhanced. As the meteor streaked across the night sky, different excited atoms emitted different colors of light. The origin of the green tinge visible at the right is currently unknown, however, and might result from oxygen in Earth's atmosphere. Perseid meteors can best be seen from a relaxing position, away from lights. Tomorrow's picture: Sher 25: A Pending Supernova?